The June Bateman Fine Art is proud to present an exhibition of Elizabeth L. Gilbert's photographs of the Maasai people of Kenya and Tanzania. The exhibition is in conjunction with the recent publication by Atlantic Monthly Press of "BROKEN SPEARS: A MAASAI JOURNEY". 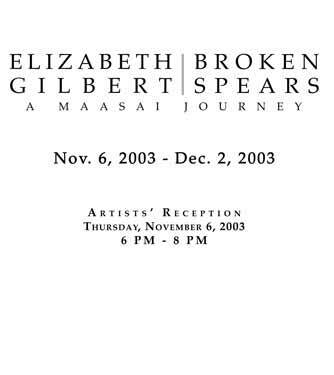 The exhibition opens on November 4 and runs through December 2, 2003. An opening reception will take place on Thursday, November 6, between 6 and 8 P.M., to which the public is invited. Ms. Gilbert will also conduct a gallery talk at the Explorers Club in New York on November 17; please contact the gallery for details. The gallery's hours are Tuesday through Saturday from 11 A.M. until 6 P.M.
Elizabeth Gilbert moved to Africa as a photojournalist in 1991 to cover the continent's political and social turmoil, photographing conflicts and crises in Somalia, Rwanda, Sudan and Zaire. Disheartened by these troubling events, Ms. Gilbert soon became entranced by the Maasai she would see on the streets of Nairobi, her home base, and the vast savannah of the Nairobi Game Park that lay beyond the city. Wanting to observe and understand the Africa that existed before colonialism and the impact of the Western world, for four years she ventured beyond the roads to enter into a vanishing world where the Maasai continued to practice the rituals that had held them together as a people for many centuries. Searching out those who clung to the traditional way of life, she listened as they told her of the ways of the past and in doing so gained the trust and understanding that allowed her to document a fast disappearing world and its unique customs. Her depiction of male and female circumcisions, weddings, the lion hunt, and daily life offer an unparalleled glimpse into this fast fading world. George Plimpton noted that "Liz Gilbert's astonishing African photographs of a vanishing culture bring to mind both the texture and feeling of Edward Curtis's work on the American Indians of the early 1900s." Peter Beard has written that Gilbert has "heroically and artistically photographed the last moments of tribal Africa... The pages of this book are already history in a compromised, ravaged, denatured continent. Luckily, Liz Gilbert has photographed what is left - everything that is authentic and valuable in Africa." Elizabeth Gilbert is a noted photojournalist whose work has appeared in TIME, Newsweek, The New York Times, Stern, Paris Match and Geo, among other publications. Her work on the Maasai has received awards in portraiture and reportage from the Society of Publication Designers. The project on which the book and exhibition are based received support from Kodak and Corbis.